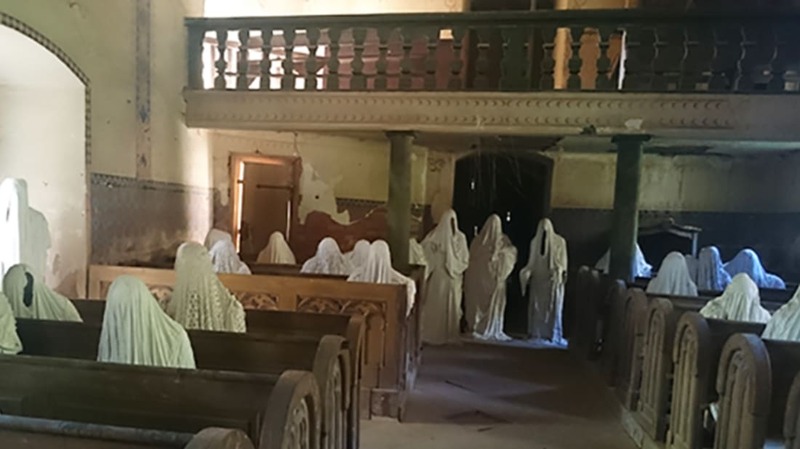 The Czech village of Lukova is proud of their ghosts—after all, they helped save a local church. Locals in Lukova, about 125 miles east of Prague, have long believed their Kostel svatého Jiří (St. George's Church) is haunted, according to Atlas Obscura. Built in 1352, the building was plagued by fires and general disrepair for centuries, but the kicker came in 1968 when part of the roof fell down during a funeral service. That seemed to confirm what villagers had long suspected: the church was infested with malevolent spirits. After that, the building was abandoned. The congregation held mass outside instead of stepping foot inside the structure. As if that wasn't bad enough, during the Communist era the church suffered further decay, vandalism, and theft—even their bell was stolen. Once the Soviet era ended, locals wanted to restore the church, but lacked the cash. Enter Jakub Hadrava, a sculpture student at the University of West Bohemia, who did what artists do best: brought our worst fears to life (in artistic form, that is). Hadrava created an installation featuring 30 life-size plaster “ghosts,” modeled on fellow students wearing raincoats. These days, the ghosts bring tourists from as far away as Australia. According to the Daily Mail, their donations have helped build a new roof and stabilize the structure. The worshippers pray indoors now. The ghosts are more than a tourist draw—they also reflect some of the dark history that haunts the region. Some say Hadrava’s figures represent the German-speaking people who once lived in the area and who were expelled after World War II. However, others say the figures are best understood as a meditation on the ephemeral nature of life itself.